A mascara so effective your eyelashes look like fake eyelashes? That’s what Benefit they’re real! Mascara is supposed to be deliver. The formula aims to give dramatic length and volume, curl, and long-wear. We tried it and thought it gave superb lengthening results. However, the effect was not as dramatic as the name suggests. In all, we think this is a great mascara. But at $23, it doesn’t quite work twice as well as drug store brands even though it’s twice the price. So it may be a better value to get a mascara from a brand like Maybelline or L’Oreal. 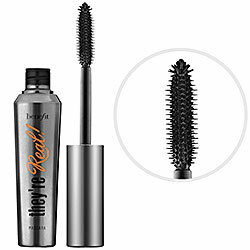 I have some untried samples of this; my favorite mascara is Maybelline Full n Soft. No gimmicks; it just works. I really want to try this out. Sounds awesome.